FORT WAYNE, IN - Fort Wayne is pleased to be hosting the 2017 Assemblies of God&apos;s Kidmin (Kids Ministries) Conference this April 19-21 at the First Assembly of God. This event will bring over 1,000 attendees to the Ramada Plaza (formerly Hotel Fort Wayne) and 5 other hotels, and over $432,000 in economic impact for the community. The event will feature over 100 practical workshop sessions about developing skills for children&apos;s ministries in churches. Learn more here. Conferences like these bring visitors (and their spending!) to our community and play an important role in our economic development. 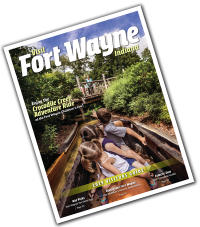 Visit Fort Wayne, the Fort Wayne/Allen County Convention and Visitors Bureau, is the not-for-profit organization whose purpose is to expand Fort Wayne&apos;s economy by attracting convention and leisure visitors. Each year, millions of dollars from visitor spending generate increased commerce, sustained jobs and enhancement of Fort Wayne&apos;s image.